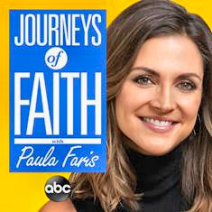 "Journeys of Faith With Paula Faris"
ABC Radio will launch a new podcast hosted by ABC News senior national correspondent Paula Faris, entitled "Journeys of Faith with Paula Faris." The first three episodes will be released on Wednesday, November 14 and will feature interviews with ABC News' "Good Morning America" co-anchor Robin Roberts, Country recording artists Luke Bryan and Hillary Scott and political commentator and author Ben Shapiro. In each episode Faris sits down with her guests for a look at how they've used faith and spirituality to guide them through the best and worst of times. "We are excited to welcome ‘Journeys of Faith' as the newest addition to ABC Radio's expanding podcast collection," said ABC Radio VP/General Manager Steve Jones. "We love the passion that Paula brings to each interview and believe listeners will enjoy the illuminating discussions featured in each episode." The first season of "Journeys of Faith" will feature ten episodes, posting every Wednesday.